It is common for Vancouver journalists to bemoan the “fiasco” of the Olympic Village, but they are so often bogged-down in financial matters above their pay-grade that they forget the true fiasco of South East False Creek. Indeed, the Village embodies a profound scandal. At the core of the scandal is that governments broke their social housing promises at the site and then lied about it. The original plan for the Olympic Village was that 2/3rds of the 1100 units would be affordable, a full half of which would be social housing for those most in need (“deep core”). The rationale for these promises goes back to the very start of the Olympic bid process. There was much concern that Vancouver’s affordability crisis might grow on account of winning the Olympic bid, pushing the most vulnerable residents into homelessness. In their Inclusivity Statement, the Olympic partners committed to mitigating these impacts, and to providing a positive social housing legacy through projects like the Athletes’ Village at South East False Creek (SEFC). This latter promise was repeated constantly by government officials for years in the lead-up to the Olympics. The Mainlander saved a copy of the report here; for the relevant quotes, see page 16 section 3.2.1: Meeting Basic Needs, Providing Appropriate, Affordable Housing. It is well known that NPA-led Council elected in 2005 began gutting social housing promises. In March 2006 Council reduced the low income “requirement” to from 33% to 20% (but maintaining the “goal” of 33%), and eliminated to the “requirement” of 33% middle-income from the buildings around the central square (but maintaining the “goal” of 33% there). On Oct 26 2006 the NPA ammended section 3.2.1 of the ODP to reflect these policy changes. It should be noted the plan was to have a residential income mix throughout the Village. The income requirements were to apply to each of the three sections of the public lands (called sections 1A, 2A, & 3A). Then, on Dec 13 2007, in private Council meeting, the NPA decided that they would build 250 “affordable housing” units in only one of the sections (parcels 2, 5, and 9 of in section 2A). The $32 million put toward these units at the time came from VANOC as part of the “Olympic Housing Legacy.” Even if all of 250 units were dedicated low-income units, that would have accounted for the 20% low-income requirement. But what about the other 250-350 middle-income units? The answer was left ambiguous, probably deliberately so, until after the Olympics. Vision Vancouver won the 2008 municipal elections, claiming that they “strongly opposed the previous NPA administration’s cuts of middle and low-income housing from the Southeast False Creek Olympic Village site.” Mayoral candidate Gregor Robertson himself stated forcefully: “Peter Ladner and the NPA made a big mistake when they cut social housing from the Olympic Village and replaced it with high-end luxury housing” (click here for link). On April 21 2010, Mayor Gregor Robertson reiterated: “I think it’s important that we honour our commitment to affordable housing in the Village.” One day later, on April 22, both Vision and COPE voted to officially transform half of these 250 units into market units for police (and other public sector workers, but only on account of an amendment proposed by an anti-poverty delegate at the April 22 Council). Now the original promise of 33% low-income and 33% middle-income had been reduced to at most 10% and 10%, respectively. 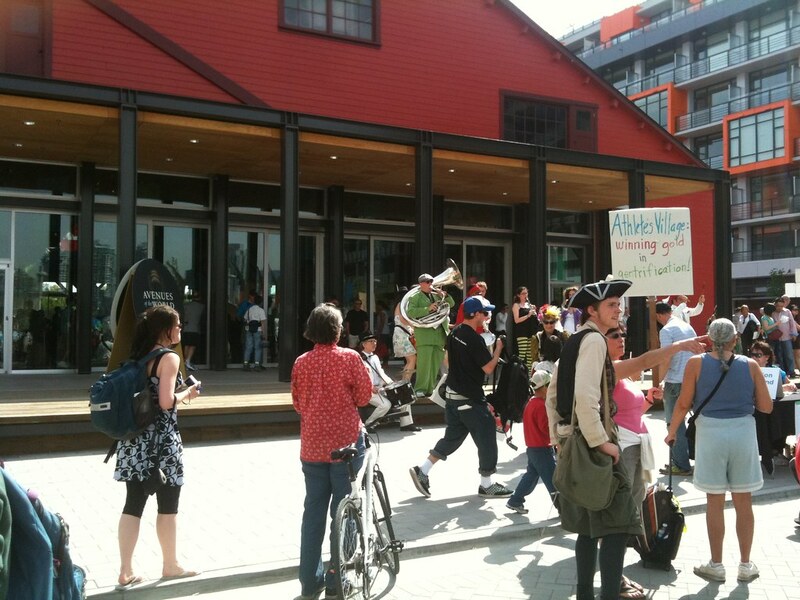 In response, on May 15 2010, there was a substantial protest at the Olympic Village (links: MetroNews, 24hours, TheProvince, CBC) demanding that the original promise of 2/3rds affordable housing be met. Protesters made speeches about the broken promises to potential condo-buyers, many of whom applauded the speeches. Through the summer, the governments failed to fill even the 250 low- and middle-income units. On July 15th housing activists staged a protest sit-in inside a $2M luxury “broken promise” condo unit, planning to stay for 700 minutes – one minute for each every affordable unit redesignated as unaffordable (links: CBC, VMC#1, 24hours, VMC#2, CTV, TheProvince, VancouverSun). Ironically, 700 minutes was too long to wait for the Mayor, who ordered the protesters arrested after three hours. The last quarter of 2010 brought new opportunities and crises. On Sept 25, activists promised a tent city at South East False Creek to coincide with the one year anniversary of the Olympic Tent Village at 58 West Hastings. On Sept 30, the City recalled the developer’s loan in full. Predictably, the developer was forced into receivership on Nov 17 2010. This meant two things: first, the City was now in control of Millenium’s assets, and could therfore recoup lost profits, should there be any; second, the City was now in full charge of Olympic Village the development, and was now fully free to meet its social housing promises – although it has yet to indicate it will do so. Many journalists (e.g. this Vancouver Sun blogger) have been whipping up a right-wing fury by arguing with many numbers but little arithmetic, and without understanding the legal context, that the City is likely in massive financial turmoil. The Mainlander will soon publish a feature exposing such accounts as unreasonable, if not hysterical. The story that needs reporting is that the Olympics exacerbated the homelessness and affordability crisis just as expected. Property values increased 68% from 2005 to 2008 making Vancouver “the most unaffordable market in the world.” As a result, homelessness in Metro Vancouver tripled from 1 to 3 thousand between the announcement of the Olympic bid in 2002 and 2008. And whereas the Olympic Village was supposed to compensate for these impacts, it has become the very symbol of unaffordability and exclusion. That is the real scandal of the Olympic Village. Posted in Analysis, City Hall, Homelessness, Olympic Village and tagged City Hall, Olympic Village. Bookmark the permalink.